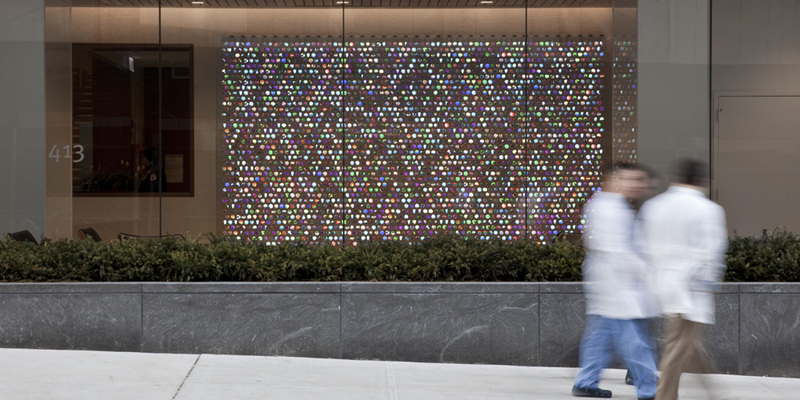 A wall-sized digital artwork created from thousands of tiny screens and lenses was designed by Squint/Opera in collaboration with Hirsch & Mann for the $650m Belfer Research Building in Manhattan, part of Weill Cornell Medical College (WCMC). The shimmering and animated foyer installation celebrates the college’s research work. The large-scale digital installation (4.6m x 2.7m) is comprised of 2800 mini screens set in a grid pattern behind a panel of thousands of circular acrylic discs – a reference to the lenses used in medical research. The purpose of the installation was to celebrate the support of the building’s donors and promote the research and discoveries made in the building. The artwork was designed as an intriguing and beautiful object to be viewed close up in the lobby or seen from outside the building as a single image. Each screen has information about medical discoveries and other news fed from WCMC’s website. The images and stories change constantly. Through the language of discovery passers-by are drawn in and encouraged to learn more. The vision of New-York-based Ennead Architects was to commission an artwork that would promote collaboration throughout the building and give a light touch to the interior fabric. To achieve this, electronics were color-matched with stone cladding and circuit boards were mounted on transparent frames. The clear acrylic lenses magnify the stonework at oblique angles and focus the screens when facing square on. During the commission Ennead Architects advised the client and briefed Squint/Opera to develop creative concepts. The concepts were delivered through a team of specialists brought together by Squint/Opera. Hirsch & Mann led the technology design, production, and delivery, The Cross Kings led the physical detail design and fabrication in Boston was completed by Design Communications Limited. Squint/Opera worked closely with Hirsch & Mann to design and build all components from scratch. This involved creating many prototypes, which allowed the team to test ideas and communicate concepts to all stakeholders, taking them on the journey of developing a piece of art. The prototypes acted as a key discussion tool beyond drawings or presentations and allowed the team to refine the design and align with the architectural vision and the brief. Squint/Opera (UK) is a creative agency and production house, working on exhibitions, films, animations, websites, print, and branding. Recent projects have included installations at the Milan Expo, Victoria & Albert Museum, and the Imperial War Museum’s First World War exhibition. Hirsch & Mann (UK) works at the intersection of people, technology and businesses, building compelling technology interactions between them. Their work includes the creation of electro mechanical wearables for Cadburys, building generative digital painting systems for The Whitney, and constructing a volumetric 3D LED display for Siemens.